Peninsular Thinking A conversation about Bremerton, Port Orchard, Poulsbo, Silverdale, Bainbridge Island, Kingston, Manchester, Seabeck, Southworth, Suquamish, Belfair, Keyport, Olalla, Bangor, Hansville, Indianola, Port Gamble, Allyn, Port Ludlow, Gig Harbor and every once in a while something about the good folks who don't have the good fortune to live here. 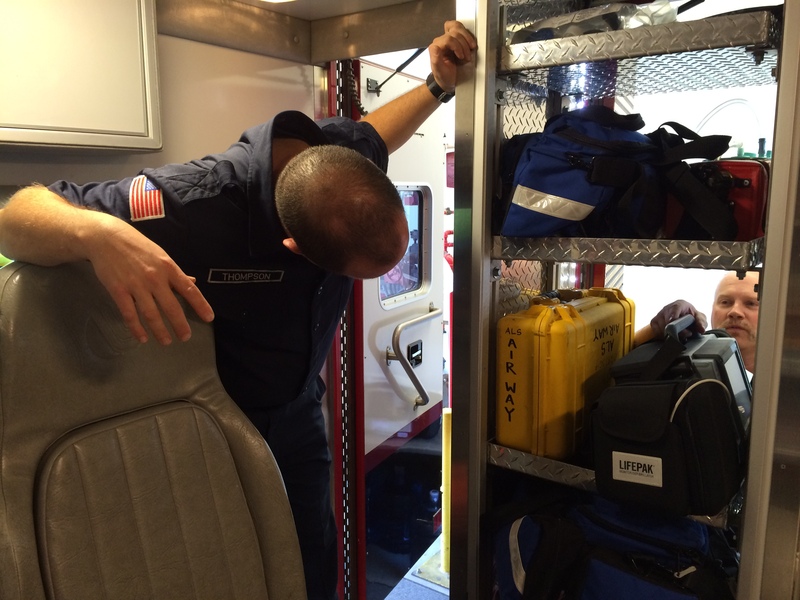 North Kitsap Fire and Rescue loads one of the new heart monitors into a medic unit Tuesday. 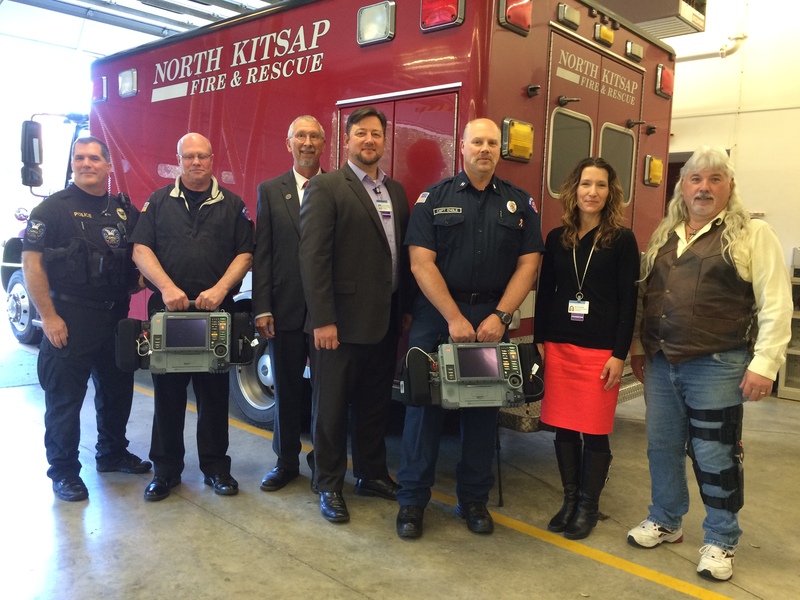 KINGSTON — Harrison Medical Center Foundation publicly launched part of a $1 million project to improve cardiac arrest survival rates in Kitsap County as it delivered to updated heart monitors to North Kitsap Fire and Rescue on Tuesday. The two monitors, worth about $40,000 each, allow emergency responders to better view heart rates while CPR is in progress, said Steve Engel, with North Kitsap Fire and Rescue. The monitors also send heart readings directly to Harrison Medical Center to see if patients require surgery for blocked heart arteries. 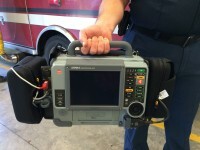 The hospital began receiving heart readings from emergency responders at a scene in 2014, although not all area fire authorities have monitors capable of sending readings. South Kitsap and North Mason do not have the technology, according to Kari Driskell with the hospital foundation. The foundation’s goal is to supply five monitors to South Kitsap and North Mason. A grant for one monitor in South Kitsap has been secured, Driskell said. The Suquamish Tribe donated the funds needed for North Kitsap’s two monitors, although fundraising continues for a third one in North Kitsap. Bremerton, Poulsbo and Bainbridge Island already have updated heart monitors. The foundation’s $1 million project is to supply each of the county’s fire agencies with updated heart monitors and CPR machines, as well as launch a CPR smartphone app. The app, called PulsePoint, aims to alert those who know CPR when they are in the proximity of someone experiencing cardiac arrest in a public location. PulsePoint also would notify users where the closest automatic external defibrillator, or AED, is. The CPR machines provide nearly-perfect CPR at the proper speed and depth — 100 compressions a minute at a depth of 2 inches — and can perform accurate chest compression while a patient is in an ambulance. Officials from North Kitsap Fire, the Suquamish Tribe and the Harrison Medical Center Foundation at the North Kitsap Fire headquarters Tuesday. 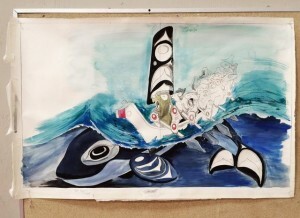 Remember the mural Chief Kitsap Academy students help design and paint? I photographed and videotaped students working on the project earlier this month. Now, you can now watch a time lapse of the project from start to finish. Up to $3 million from the local mental-health tax will be doled out July 1. A sales tax of 0.1 percent dedicated for local mental-health services went into effect Jan. 1 after being approved by Kitsap County commissioners in September. The July deadline is just one of several in the recently released strategic plan from the Kitsap County Behavioral Health Strategic Planning Team. Proposals for projects or programs, aimed at reducing the number of mentally ill juveniles and adults cycle through the criminal justice system and the demand on emergency services, will be accepted from Feb. 20 to April 18 at 3 p.m. Kitsap County County Mental Health, Chemical Dependence and Therapeutic Court Citizens Advisory Board will review the proposals. The citizens advisory board also is asking for community input on what residents what to see funded by the sales tax via an online survey. In the 62-page strategic plan, which outlines recommendations for closing service gaps for mentally ill and substance abuse, it says county and surrounding peninsula region had the highest number of mentally ill boarded ever recorded in October 2013. The plan recommends increasing housing and transportation options, treatment funding and outreach, among other suggestions. The strategic planning team makes recommendations the citizens advisory board and establishes the strategic plan for the mental health tax. Proposals will be submitted to the citizens advisory board for review. The board will make recommendations for the proposals and funding level to the county commissioners, who ultimately approve the proposals. The citizen advisory board will annually review projects and programs while receiving input from the strategic team, and report to the director of Kitsap County Human Services, who will present reviews to the county commissioners. The Suquamish Elementary family of families is gathering support for a third-grader at the school, Carmen Garringer. According to a letter sent to homes by the school’s office manager, Pamela Goodman, Carmen was diagnosed with Extraosseous Ewing’s Sarcoma. The cancer was removed, but she will require chemotherapy at Seattle Children’s Hospital for nine months. The family has to stay within an hour of the hospital during that time. It’s an expensive ordeal for the family, so starting last Friday the school organized a donation drive for students to bring in coins or cash, as well as Valentines for Carmen and her family. Those supporting the Garringers want the word to spread and invite readers to forward news of their efforts far and wide. Here’s the letter from Goodman, which includes links to two other sites dedicated to Carmen and her family. The letter was sent last week. Just before winter break, our 3rd grade friend, Carmen Garringer, felt a lump on her chest and told her mom about it. After many doctor appointments it was recommended that they remove what they believed to be a cyst with hopes it was nothing serious. However, after having the surgery the doctors diagnosed Carmen with Extra-osseous Ewing’s Sarcoma, a rare from of cancer that forms in the muscles and soft tissue. Shortly thereafter, Carmen began a very aggressive chemotherapy treatments for the next 9 months at Seattle Children’s Hospital. Carmen and her family, including her kindergarten sister Leah, face huge medical and financial challenges in the coming months, and our students and families are already asking what they can do to help. Thanks to many caring people in the North Kitsap Community, you will be hearing about multiple opportunities to lend a hand to the Garringer family. Starting this Friday, Suquamish Elementary families have organized a donation drive for students to bring in coins or cash; any gift is appreciated, whether pennies or paper. Along with the drive “Coins for Carmen”, Valentine’s will be collected and given to Carmen and her family. Donations and Valentine’s may be brought in with students, parents and staff and dropped off in collection jugs at the office and in classrooms. This site includes Carmen’s story, ways to volunteer, and a place to make direct donations. You must register to use this site, and then enter carmengarringer (no space) to view Carmen’s page. Please share this information with your children in the ways you find most appropriate, and watch for further details in email, and throughout our community. SUQUAMISH — A few Suquamish tribal members hope their participation in an upcoming rally sheds light on the recent clash between First Nations and its Canadian government. The grassroots movement called Idle No More, which started in October, is over Canada’s recent passage of Bill C-45, a 400-page piece of legislation that contains 64 regulations. It’s also known as the Jobs and Growth Act, 2012. First Nation members say the bill not only violates longstanding water and environmental treaties between Canada and its indigenous tribes, but also criticized the Canadian government for excluding tribal voice in the process. The movement has attracted international media attention, especially in the case of Attawapiskat First Nation Chief Theresa Spence, who has been on a hunger strike since early December until a meeting between Prime Minister Stephen Harper and First Nations leaders occurs. The collective Idle No More efforts and sentiments resonate loudly for some Suquamish tribal members. Some relate the Idle No More movement to the Civil Rights movement that aimed to eradicate racial discrimination, among other injustices. If longstanding treaties are broken in Canada, other governments might copy it, Gyasi Ross, a Suquamish and Blackfoot tribal member, said of the Idle No More movement. “Decisions Canada (is) making now, I have a feeling would affect US tribes,” Ross said. Rallies, flash mobs and demonstrations have been popping up across the US in recent weeks in support of the movement. Ross plans to participate in a rally Saturday near Pike Place Market in Seattle that supports the cause. This is the second rally he’s participated in recent weeks; the first one packed Westlake Mall, and an online video produced by Ross and a few of his friends has since received more than 35,000 views. “We better get involved in the discussion because it affects both sides. We see land as a complete whole. When we see something that affects upstream, it also affects downstream,” he said. Suquamish tribal elder Marilyn Wandrey will give the opening remarks at the rally on Saturday. The 72-year-old said she knows many tribal members affected by Canada’s recent bill change through annual canoe journeys along the Canadian border. James Old Coyote, a Sto:lo and Hidatsa tribal member who lives in Squamish, hopes his attendance at Saturday’s rally will shed light on the movement. Like Ross, he’s concerned about what sort of precedent Canada’s recent law passage could mean for tribes elsewhere. “It’s not just a native issue. You see a bunch of Indians get all radical and fight the government… but it’s a much bigger picture. It’s our earth and we live in it. If the government up there has the ability to eliminate those treaties that were signed… is that going to be a trend happening down the states?” he said. Check out a video Ross and his friends created during the flash mob in downtown Seattle. Jason Beattie, a 1996 Bainbridge High School graduate and music video director, is planning another project in his old stomping grounds. Beattie, now with Ghost Town Media of Los Angeles, in July shot a video at Bremerton’s Skateland featuring U.K. singer Cheri Moon. See an example of Aoki’s music below. In choosing Kitsap County as the location for the video, Beattie wanted to break out of the monotony of L.A. videos by showing viewers a new area of a the country and a culture they may not be familiar with. He thought a spot featuring Native Americans would fit with the message of the song. Beattie is drawn to Kitsap County for obvious reasons, but will Kitsap become the next big location for music videos? Why not? We already have our partially rotten foot in the door with “Zombies of Mass Destruction,” filmed in Port Gamble. Beattie has contacted members of the Suquamish Tribe to broadcast the need for Native American families, children and dancers. Members of other tribes also are welcome to tryouts at a yet-to-be-disclosed Poulsbo location Monday through Jan. 17. Contact aokicasting@gmail.com.